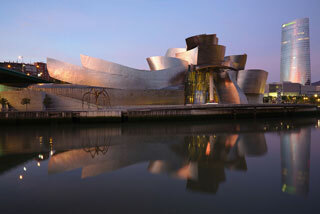 The Guggenheim Museum Bilbao is a museum of modern and contemporary art, designed by Canadian-American architect Frank Gehry. One of the most admired works of contemporary architecture, the building has been hailed as a "signal moment in the architectural culture", because it represents "one of those rare moments when critics, academics, and the general public were all completely united about something." The museum was the building most frequently named as one of the most important works completed since 1980 in the 2010 World Architecture Survey among architecture experts. This article uses material from the Wikipedia article "Guggenheim Museum Bilbao", which is released under the Creative Commons Attribution-Share-Alike 3.0 License.